Before placing your order, you will have to determine the size and shape of your mast's luff groove. If you have an external track on your boat now, Tides will need the width of this external track. 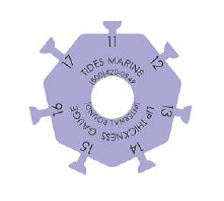 To help measure the luff groove on your mast, Tides will provide you with a set of 5 blue measurement discs (pictured below). Lettered Discs shown on the left, are used to measure the luff groove width on both Internal - Flat and Internal - Round spars. 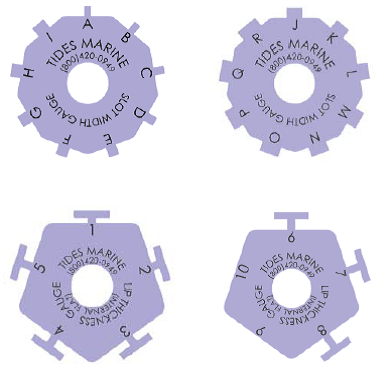 Numbered Discs shown above, from 1 through 8 are used to measure the luff groove's lip thickness on Internal - Flat luff grooves. Information about flat internal luff grooves can be found on the Internal Flat SailTrack page. The Numbered Disk 11 through 17 shown above, is used to measure the luff groove's lip thickness on Internal - Round luff grooves. Information about round internal luff grooves can be found on the Internal Round SailTrack page. Order SailTrack Measuring Discs HERE.